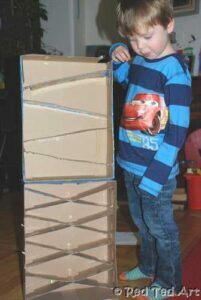 I do like to practice as I preach and practice we did when we made our cardboard box marble run this week… Last week we had the Cardboard Box Craft round up and in there I had featured, this very straight forward marble run from Inhabitots V1. They made theirs out of a cereal box. 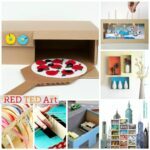 We made ours from a couple of toy boxes that have been knocking around for a while. 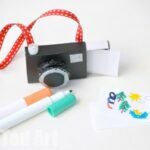 This makes a great addition to our special Crafts for Boys series too. 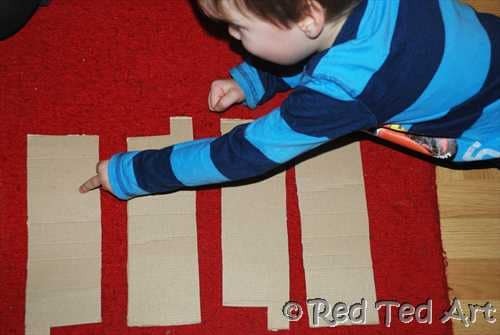 We made a simple and super easy and super fast marble run. And then we got carried away and made a second “criss crossing” marble run. Fab. Meet Einstein, by Mariela Kleiner. 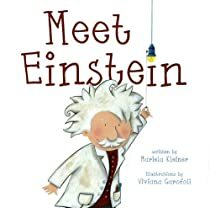 What an adorable book about Mr Einstein himself and science in general. Red Ted asks me all sorts of difficult questions and I try and answer them as simply but factually as possible. Today he asked why the marbles keep running down our run. I told him: Gravity. What is gravity? Gravity makes things fall down. Look, if I hold the marble and let go, it falls down. When it is on a slope it goes down the slope. Aha. Out comes Meet Einstein and let’s find out all about Science. Hooray. The books focusses on light and gravity and on how science is all around us. Helping us make connections between things. There is also a section for parents on Einstein, as well as a page of questions for discussion with your kids. The book also reminds me of Science Sparks. 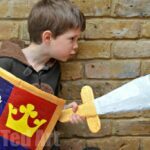 I don’t know if you have come across Science Sparks yet, but it is a activity based resource website run by two fabulously sciency and passionate ladies. What I really love about Science Sparks, is how it brings science into all sorts of day to day situations, getting children to think about and explore their environment – in a really easy and fun way. Meet Einstein perfectly complement their site and aims to achieve the same thing. Right… now to make our marble run. Red Ted has been BEGGING me to make one for weeks and now, finally, with the school holidays and some cardboard boxes we made a super duper one! 1) We first made a simple one (left) and then a slight more difficult one that criss crosses (right). For both, we separated one side of the box and layed out any pieces. 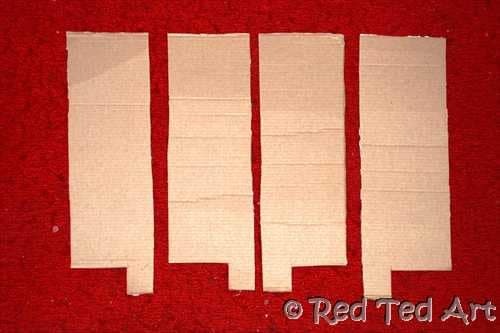 2) For the simple one, we cut 4 panels. 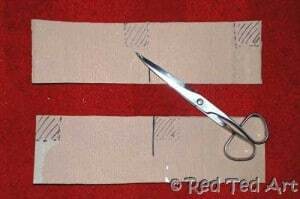 As you will be placing these at an angle, they do actually fall SLIGHTLY short, but you can manage this by sellotaping it all together a little tighter. This will pull in the sides of the marble run slightly. For the criss crossing one, we were lucky enough that the box had flaps, which meant extra card. Enough to cut 8 panels. They are slightly narrow, but it works. 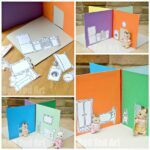 We had our lovely crafty friend visiting and it was very handy to have her help stick.. I could then take photos! 3) Simple one (left): cut holes ofr your marbles to drop through at either end. Two facing one side and two the other. 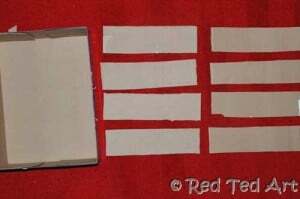 For the criss cross one (right): you need slot the two pieces of card together AND cut additional holes for the marbles to run through. Check out the photos to see the pattern. The key thing is NOT to cut half way through both panels, else the whole thing will fall part when you cut the marble hole. One panel has a slot 2/3s along the way and the second panel has a slot 1/3 along the way. This allows for the placement of the second hole. The photos show a square hole in the panel.. in fact we ended up making the hole a little bigger – more of a rectangle, which later allowed for slanting flatter. 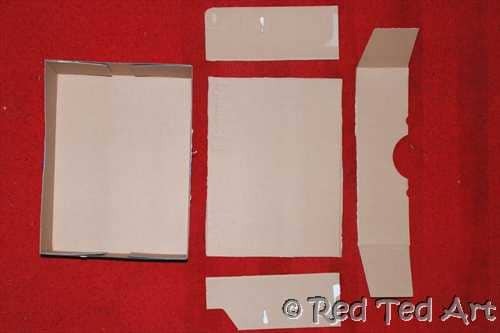 Criss Cross – again you will be slightly short of the width of the box, but just draw the sides in a little with tape. Secure with tape all around – including an extra but of tape at the cross section. 5) If desired, decorate your cardboard marble run. Play. 6) And play and play with your cardboard marble run! Would love to see any cardboard box how to’s or makes you have come up with? Or have you maybe made a marble run yourself? What an amazing way to connect this marble run project with the Einstein book to explain the science of gravity! The book does sound FUN. Sharing this on my blog FB page…! 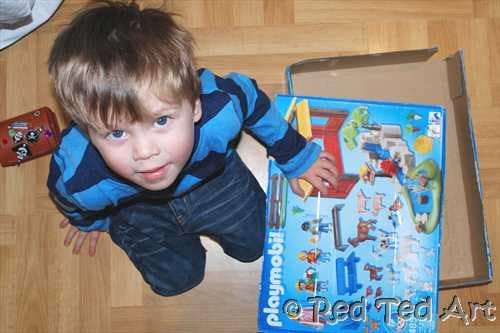 I love your marble run! \”Meet Einstein\” sounds like an adorable book. Your marble run is seriously impressive! This is awesome!! 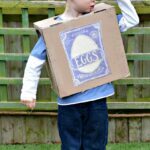 My kids would totally get into this. Thanks for the idea!! What an awesome activity… thanks for hosting!! So glad you like it! And thank you for coming and joining in! I\’m visiting from Weteach. 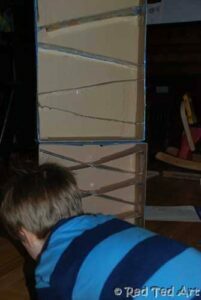 I love this homemade marble run!!! 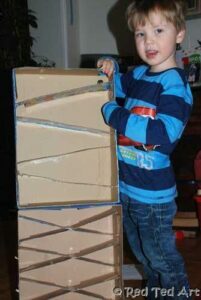 We made one about a year ago with toilet paper and paper towel tubes and magnets (from Family Fun magazine), but this one looks much easier. We\’re going to have to try this! Thank you for sharing. so neat! we got our first marble run a few weeks ago & the girls LOVE it! I know we have to try our hand at making our own! 🙂 You made it sound so simple & doable – just the encouragement I needed friend! 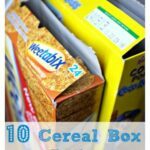 I am going to start looking for boxes! We were just doing a fun activity today the this would have been awesome for. Check out what we did today. You could use it with your marble run. Oh my those beads look GREAT!! I see what you mean!!! Kerry oooh yes.. you are right, I could have talked about acceleration too! Will do when we play with it tomorrow! Love the marble run! We made one a few years ago after seeing it posted on Made By Joel. 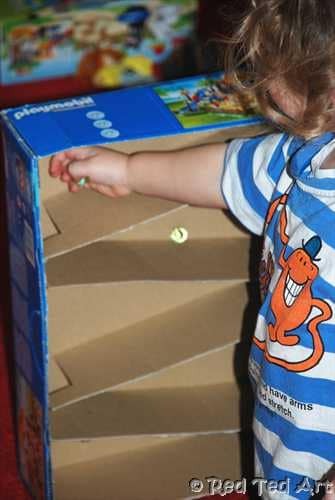 Great idea to make it out of sturdier boxes. 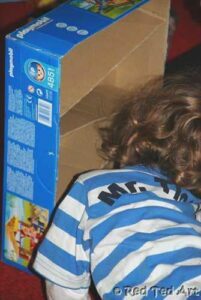 Ours, made out of cereal boxes, was well-loved and fell apart pretty quickly. Yes, I think the Inhabitots had Joel Guest Post for them!! 🙂 We do need to reinforce ours every so often too, but so far so good! 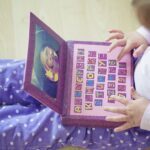 What a terrific post – great book, project and a website recommendation! I\’ll make sure to check the book and the website out! It has a wrong link.. I like this site.. it\’s so fun!!! So fun! My boys would love this! What fun! I think even my big girl would like this book and making a marble run. I\’m off to reserve it at the library. Thanks! Holy cow, I had been thinking way too complicated when we made our marble run…now I definitely want to try making this with my boys. SO much easier! Tell me about it! I was massively overcomplicating it at first too!! !